Time4Learning is an online student-paced learning system popular as a fourth grade homeschool curriculum, as an after school tutorial and skill sharpening during the summer break. During fourth grade spelling lessons, children learn about suffixes such as -ED, -ING, and -TION, and inflections used with them, such as dropping the final letter on most words ending in E, for example, TIMING and USING. Fourth grade spelling lessons also introduce prefixes such as A-, EX-, IN-, and UN-. Students will also learn to spell words with the “ie” and “ei” learning the spelling rules and exceptions that comes along with spelling. Children learn through spelling activities that include many creative methods that make the fourth grade spelling program fun for them. Remember, every child learns at a different rate, so what works for some students, may not be the correct approach for your child. Which is why so many parents enjoy Time4Learning’s self-paced, modularized lesson plans. You can skip lessons that teach concepts your child has already mastered and repeat those he or she has not. The choice is yours. Time4Learning teaches a comprehensive fourth grade spelling curriculum using fun activities to build a solid spelling foundation. 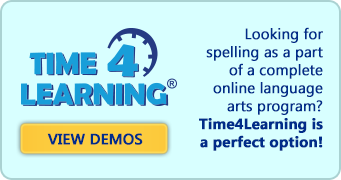 Help your child excel in spelling by trying out one of our Time4Learning’s fourth grade demos. What spelling words should your fourth grader know? Here is a list of 50+ words that are great for use in spelling games, tests, or practice for an upcoming spelling bee. To add more value, download our 4th grade spelling list printable worksheet with +300 words! VocabularySpellingCity offers a fun and easy cross-curricular word study with vocabulary, spelling, phonics, and writing activities. Create your own spelling lists or use one of our 10,000 + pre-made lists. Students will feel like they're playing while they master each week's words. Fourth Grade Vocabulary and Spelling Lists – a free website that offers a fun and easy way to practice vocabulary and spelling words. Create your spelling list using the vocabulary words below and let SpellingCity teach them, use them in games and test your kids on them! At first, I was skeptical about using a computer program for reading. But the progress we made is really clear and I couldn't be happier that we tried it! In sixth grade language arts, there is an emphasis on reading comprehension and writing skills.